COMCIT™ – Taking Skin Rejuvenation to the next level. COMCiT is: Cryo Oxygen Microchanneling Collagen Induction. It offers the simultaneous delivey of Cyro Oxygen whilst our unique Microchannelling Roller creates thousands of microscopic channels in the dermal epidermal juction. This allows the topical infusion of the powerful skin rejuvenation ingredients to be driven into the skin alongside cold oxygen. This is the most effective skin rejunvenation system yet as we are effectively getting down to the layers where skin health begins. These are the layers we need to reach to promote new Collagen growth. COMCIT employs a revoluntionary Cryo Probe that discharges cold oxygen through an internal peltier system and delivers onto the skin without any feeling of discomfort. The cold oxygen rapidly cools the skin and stimulates the micro-circulation, positively increasing blood supply and thus providing nutrients necessary for the stimulation of fibro-blasts for collagen production. The Microchannelling Roller offers multiple single-use head sizes, varible depending on individual treatment concerns. 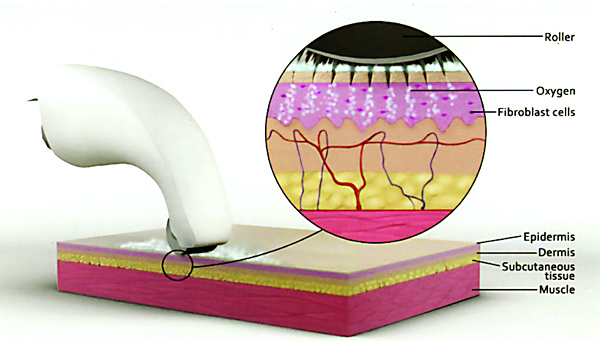 It is moved over the surface of the skin to create microscopic pinpricks. These pinpricks create columns within the epidermal dermal junction where collagen and elastin fibrres are located. The COMCIT Cellular Infusion Solution penetrates into the columns and these minute punctures close almost immediately as the skin heals. The micro-induced trauma created to the dermis encourages the body to produce new collagen. As a result the skin becomes thicker, plumper and more youthful. Beautiful, rejuvenated skin with COMCIT. Acne prone skin (particularly effective due to the anti-bacterial effects of both the oxygen and infusion). Body treatments, tops of arms, thighs, stomach. Crystal Clear Microdermabrasion is known as “The Beauty Treatment to the stars”. From a simple Beauty Flash providing an instant rejunvenated texture & lift to tired skin, to a more in-depth beauty treatment for lines, wrinkles, acne scarring, stretch marks & pigmentation problems. Microdermabrasion offers a safe, controlled method of skin exfoliation through mechanical abrasion of the dead skin cells.